In beautiful late winter weather in February 2008, I worked my way around the churches to the south and west of Stowmarket. 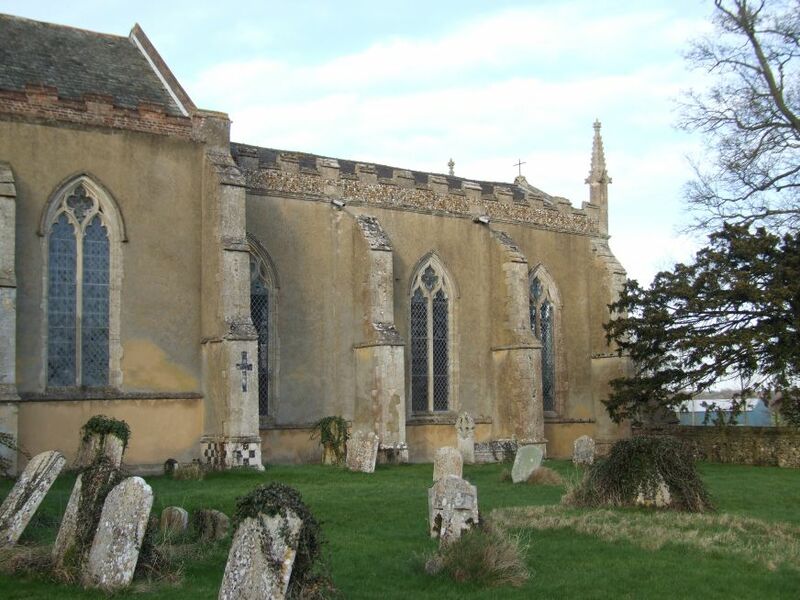 Buxhall church is not far from the main street in the neighbouring parish of Great Finborough. That village's medieval church stands like a beacon above this relatively steep valley, its weird spire a product of Richard Phipson's little known 'psychedelic drugs' period. Heading down off of the Finborough road, however, there is a return to normality, and on the west side of the valley is an altogether more grand and dramatic prospect. Beside its splendid 18th century rectory rises the great edifice of St Mary, Buxhall. On the other side of the church is the parallel road to Hitcham. 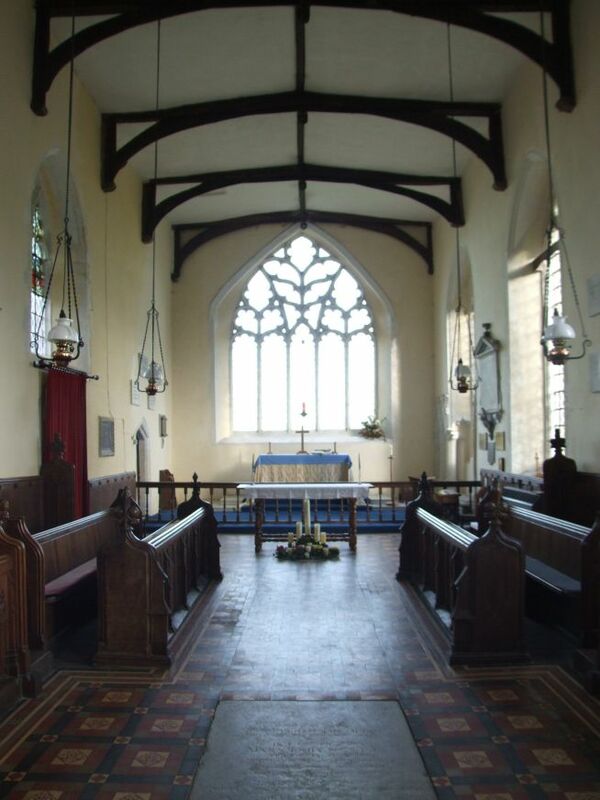 On my first visit eight years ago, I had arrived from that direction, and overshot the road to the church (mostly because I was open-mouthed and drooling at the sight of the old rectory - it's enormous) . I found myself leaving the village on the other side. Here, I passed the headquarters of Kevin Mayhew Publishing, whose sheet music and hymn books can be found in Catholic churches all over the world. It seemed rather curious to find their presence in this little English village. I found a footpath back to the north side of the church; after about 200 yards, though, it dumped me on what was apparently the Rectory lawn. Or, at least, that was what it felt like, but the shape and position of it suggested that it might once have been the northern graveyard of the church. An old lady walking her dog confirmed this for me, and said that the people at the Rectory maintained it, but it still belonged to the church. Eight years later, having grown older and more conventional, I arrived by car and parked in the car park to the south of the church. On this side is the lovely, overgrown graveyard, still full of 18th and 19th century graves. 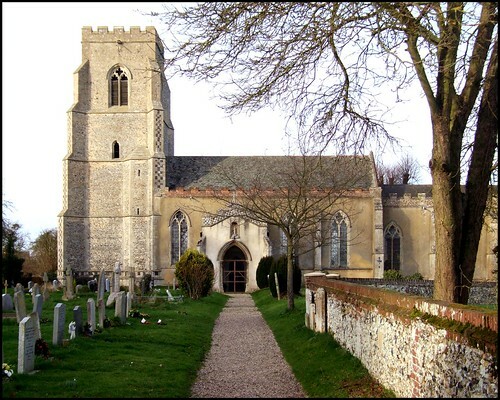 In a land of Perpendicular glory, St Mary is a Decorated jewel, rebuilt in the early 14th century at the height of medieval confidence, before the horrific starvation, disease and recession that would disfigure the rest of that unhappy century set in. The tower is slightly earlier, and as grand as they come. Brick battlements on the nave add a touch of the exotic, and the east end of the chancel is turretted in a fancy way. There is one rather unusual survival. On one of the buttresses on the south side is a cross picked out in flint. 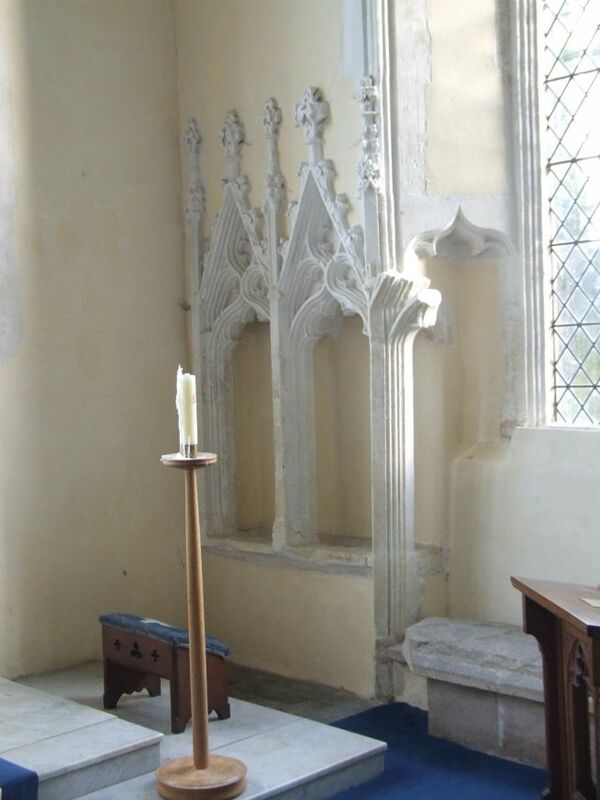 This seems to be intended as one of the consecration crosses from the 14th century rebuilding. There are a set of them not far off at Creeting St Peter. Quite why only one has survived here, and in such excellent condition, is a mystery.Going inside, there is the slight disappointment of discovering that the interior by no means lives up to the medieval glamour of the outside. Here, the inside was completely done over in the 1870s. The architect was the Rector, Henry Hill, but one detects the influence of Diocesan Architect Phipson in a rather more restrained mood. The nave is rather interesting, I think, largely on account of the benches, which are really very good, all handcarved in oak. They were the work of Agnes Hill, daughter of Henry Hill. The Copinger Hills were a remarkable family. They were closely associated with the church over the course of six centuries, as Lords of the Manor and as Rectors. They provided Rectors throughout the 18th and 19th centuries, and well into the 20th. When I visited in 1999, the current Rector was only the third of the 20th century. The benches were made with oak from the Hills' Buxhall estate, and bear the Copinger Hill arms. Their name is found again and again, on memorials and dedications, throughout this church. They provide a vivid explanation of why the adjacent Rectory is just so grand. A plaque records the death of the last of the male line in 1973. If you look up in the nave, you'll see a decent 20th century roof - but that in the chancel is mid-17th century, a rather curious date. 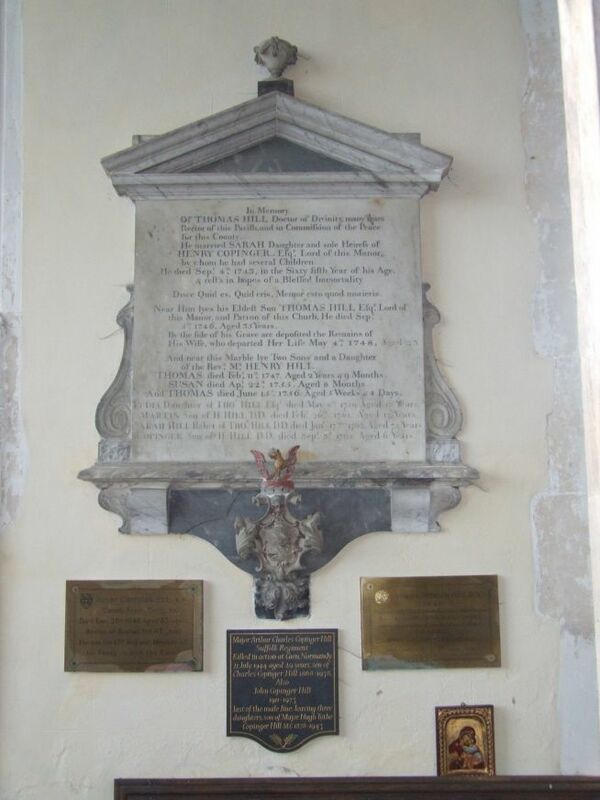 In fact, it can be dated exactly, since the figures 1656 are inscribed on one of the beams. At this time, chancels certainly weren't used for any sacramental or liturgical purpose, so one wonders why it was felt necessary to reroof it at this time. Perhaps it was in use as a school room or meeting room. 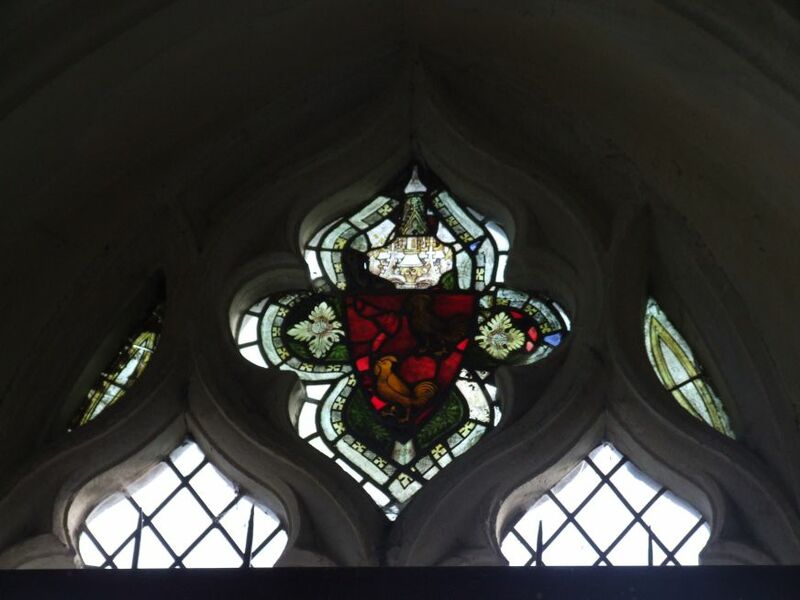 There is some medieval glass surviving in the chancel, in the tops of windows. 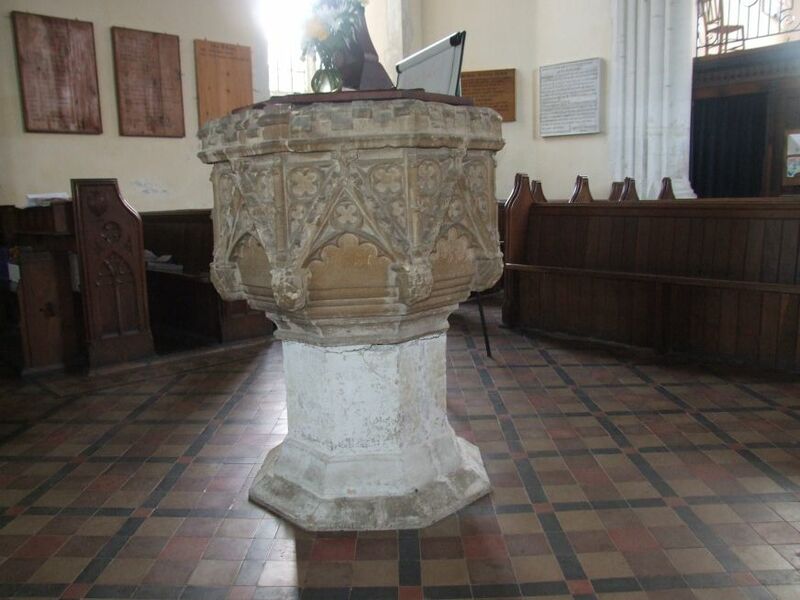 Some of the images appear to be heraldic, but you can also make out the poisoned chalice symbol of St John. One medieval survival is a superb double piscina to the south of the sanctuary - obviously, it once continued westwards as sedilia. 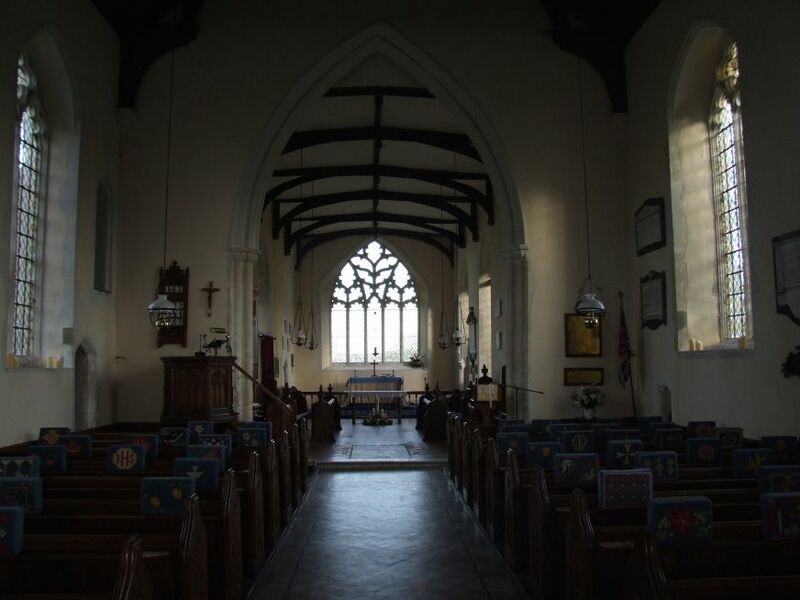 Others include a guild altar piscina in the nave, and some woodwork in the chancel - nothing substantial, but lovingly preserved. I was struck by a wholly beautiful child's headstone beside the path - when these are done so well, they are the most moving objects you can hope to find. There is another lovely one not far off at Nettlestead.